As a child, I remember loving to play on the teeter totter. Up and down, up and down we would go without a care in the world. Even when we were down, we knew that in just moments we would be heading towards the sky once again. But my favorite part, oh my favorite, that place in the middle. You know what I mean, right? When you positioned yourself just right, a little to the front, a little to the back, and threw those legs up to see if you could balance. Life and motherhood is a lot like that isn't it? There are days when we are at the very top, flying high. There are days when we are at our lowest, struggling to make it back to the top. And mostly there are those times in the middle when we are just trying to keep everything balanced. The only difference? That teeter totter we played on as a child was a lot more fun! Balancing adult responsibilities? Yeah, not as much. Most days we're just doing what we can to keep one side from crashing down. I don't know about you, but I needed this book! It seems like every time I turn around, I've got something else added to my plate. Trying to balance the needs of my husband, the needs of my kids, the commitments I've made to my church, blog work, photography work, housework. Some days it comes easy, and other days you just feel like giving up. How are we supposed to do all of this!? As mothers, we take a lot upon our shoulders and if we're not careful we will find ourselves off balance, cranky and quite honestly, no fun to be around. 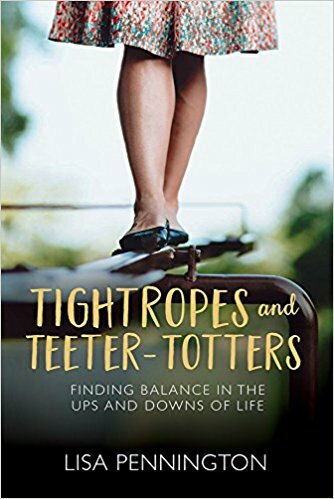 'Tightropes and Teeter Totters' can help us find that balance with practical and entertaining tips, as well as biblical truths. It will also serve as a great reminder that no matter how put together and balanced all the other moms seem to have it, we truly are not alone in feeling like we're high on that rope and one tiny breath could knock us right over. 'Tightropes and Teeter Totters' in available to purchase now. Learn more and purchase a copy. This sounds like a great book and I could really use some help right now! Balance is the struggle of my life, it seems, and I feel like I'm always working to get it right. I'm not a mom, but I know many mothers who would love this book! Thanks for sharing.